I guess I have Anna Wintour September Syndrome this September…my September newsletter is the largest and best one I’ve done to date – so much so that it requires some intro here for my subscribers. If you aren’t a subscriber, (as they say on Fox Business News) – demand it!!! How I approach fitting has been honed through decades of fitting one different shape after another. I do get return clients – from deb to bride, but frankly once a gal has done a beautiful debutante gown from me, she doesn’t ever need a second one – once you are “outed” (as Jane Austin would say), you’re outed, and no need to do it again!!! Same is true of the wedding gown – one large beautiful gown, and even if the marriage doesn’t make it, there’s really no need for another gown. So my clientele is mostly from my reputation and my beautiful work. But that also means I have a different size, shape and style every year – a lot of them. I grew into a finely-honed system to determine the proper fit for each client. Because a good fit not only feels good, it looks good, but with it also comes a certain level of education. I can do a lot, but I must obey the rules of physics (primarily gravity), so there has to be some education about what and how much will defy gravity, and when will gravity take over…..sort of like the event horizon of a black hole. After that, believe it or not, it’s getting them to get picky. Most professional sewists complain about their clients being too picky – I’m the opposite and I have to practically dig at them to be picky. It’s that pickiness that gets me the answers that I need to make their dress perfect, and when the moms apologize for the kid being too picky, I always say, NO – I love it!!! And I do. And this comes from the damage that the cheap-clothing industry has done to our sensibilities. So here you go to the store – you don’t have too much in mind, but you’re looking for a red dress….start at the right – no, something that revealing is not what you’re looking for….next right, too short, middle right too low and too long, middle left, too tight, next left – nice but not in your size (they only have it is a 0 & 2 – great!!! ), and then you’re left with a matronly – no shape sack!!! Why oh why can’t you just find a simple red dress in a nice classic style that doesn’t have a lot of stuff on it or it’s two sizes too small and cut down to your belly button with the hem up to your fanny! So what’s a shopper to do – they either settle for the sack, or they think well I could get yellow, even though I know I don’t look good in that color, or I could wear that outfit I bought 5 years ago that I wear to all these kinds of events……..
That’s what cheap fashion has done to us. It’s given us a plethora of bad choices – we get to choose from bad and worse, and the enticement is that it’s only $14.95 or $7.45 and even though it won’t last through 5 washings, how bad could it be? Pretty bad! But then there comes the business about sewing and thinking about running into that same old fitting problem that ‘s there every time. It’s like we’re defeated before we start when we’re shopping and defeated half way through when we’re sewing. 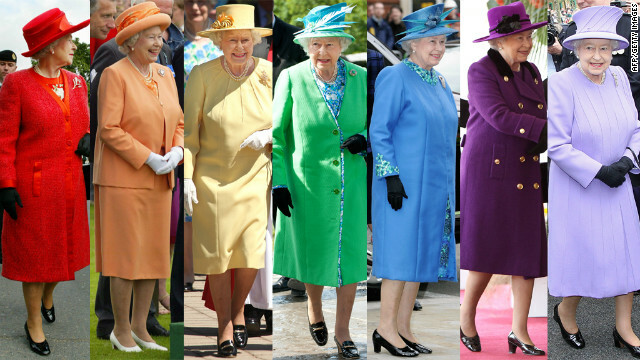 And do you think any of these ladies bought these outfits….maybe one or two of Judi Dench’s but none of the others were purchased. They were made. And you can not tell me that your figure is any worse than these ladies who are clothed beautifully. Their clothes are NOT two sizes too small, they are very well groomed, and look very wealthy – – cause this is how the very wealthy dresses – they do not buy stuff that is two sizes too small and think it fits!!! I know I sound a little emphatic but this is a constant argument I champion. And here’s the bottom line in all of this – how do I know this works – because it’s worked for me for 50 years. When I quit smoking (yes, I was one of those), I gained about 20% of my weight – for a short person that was a lot of weight, but I wore and made clothes that masked it well, and people comment 5 or 6 years on down the road that I never gained weight when I stopped so it was easy for me to quit smoking!!!! IT was all smoke and mirrors, or in my case – just mirrors since there wasn’t any more smoking going on!!! Ha! The point is that if your clothes fit and if you are well groomed and neatly attired and tailored, you don’t look that heavy. Now no one is going to think that Camiller and the Queen & Dame Dench are starving French models, but no one looks at them like they should be on People of Walmart either!!! And that’s about our choices these days — sew for yourself, or look like People of Walmart! So I know fitting is a problem for a lot of people, and it is a subject near and dear to my heart, so pardon me for my AWSS (Anna Wintour September Syndrome!) The newsletter is big and that’s just it!!! And I split it up too! Great newsletter! I’ve been struggling with this exact issue for a while now as I’ve slowly evolved into an “apple” figure! The last couple of days, I’ve been looking at a sheath pattern I have. Loving the look but really afraid it will be such a waste of time and fabric because I’m not sure how to fit it to make it look good. Do I need to somehow camouflage the back fat, belly, and large hips? Or should I just stick with something like the old tent dresses that were in style in the 70’s? Questions, questions!!!! Just because you’re not svelte doesn’t mean you can’t be fit. With my apple shaped clients I love using that side bust dart. What this does is keep the line of the garment clean around and under the arm. When you can see the side (because there isn’t that glob of fabric under the arm) of the garment under your arm, and then shape it to you – shape, which means that it fits with ease, THEN you flare it slightly out from that, this can make a VERY attractive line. But I will be honest with you, you won’t have much space to fiddle with here. If you’re on facebook – like my SewingArtistry page, and I’ll put up a post with pictures. OK – did that and here’s the link to it – hope this works!